Picturesque sunset venues on the Greek Islands were frequently very sociable places. 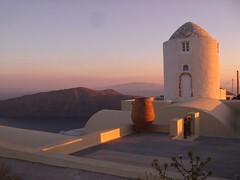 By contrast, sunrises were more deserted, peaceful places, highly recommended. This scribble was published on Saturday, August 30th, 2008. You can follow any banter on this scribble with the RSS 2.0 feed. You can share your inspired musings after typing the anti spam word near the bottom of the page. But no Pinging because its too naughty.